Did complex life originate on Earth … did any life “originate” on Earth!? My guest tonight, Dr. Chandra Wickramasinghe, firmly believes that it did NOT. His model (along with the late Fred Hoyle) is that “life” originated “a long, long time ago …and [maybe] even in a galaxy far, far away ….” And, yes, that Octopi — so the best genetic evidence currently suggests — did NOT evolve on Earth! Join us … for a totally fresh look at “where did we [biology] REALLY come from ….” Richard C. Hoagland Richard’s Items: 1- NASA’s New Exoplanet Hunter Just Buzzed the Moon and Snapped Its 1st Photo! 2- Time Lapse Captures Hawaii Volcano Eruption 3- Conspiracy Theorists Reveal Why They Think Harry Married Meghan Markle so Quickly — and It Isn’t for Love 4- Viruses, ET and the octopus from space: the return of panspermia 5- Kelly’s Items: 3- Chandra’s Items: 1. 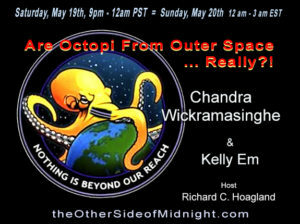 Polonnaruwa meteorite as proof of extraterrestrial … Continue reading 2018/05/19 – Professor Chandra Wickramasinghe & Kelly Em – Are Octopi From Outer Space … Really? !